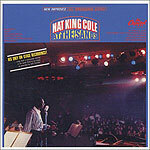 CD review: "Nat King Cole at the Sands"
At a time when black Americans couldn't shop in the same stores as their white neighbors, nor send their children to the same schools, Nat "King" Cole was a favorite entertainer for much of white America. How that came about is the domain of the various box sets detailing his career (which, as the new Verve/Blue Note Definitive Series illustrates, began as a serious jazz pianist). What this new reissue of an old vinyl album shows is where Cole was when he was achieving major cross-over fame and acceptance. Holding court at Sinatra's Vegas stomping grounds of The Sands, Cole shows himself to have grown into the ultimate showman. Completely confident on stage, in full command of both his own performance and the backing band, Cole absolutely owns the audience. All the more remarkable that when this set was captured in 1960, Vegas itself had yet to completely integrate  and the room that night was undoubtedly lily white except for the talent on stage and the service help. Yet if you listen to Sinatra's live recording from the Sands just a few years later, the applause and cheers for Cole are no less than for Sinatra. His own popularity was at a peak, his singing was at hits smoothest and most powerful. Clearly Cole had arrived, and he knew it. While jazz purists may prefer Cole's earlier trio sides, the audience Cole's popular material brought him dwarfed anything he would have ever achieved in jazz. Backed here by a full orchestra with strings, he is in his element  an entertainer in front of a loving crowd. Besides, like Sinatra, like Ella Fitzgerald, like Tony Bennett or Sammy Davis Jr., Cole reflected his World War II generation in that huge swaths of jazz run through every song he touched. Even on his tamest pop hits, like "Ballerina" or "You Leave Me Breathless," the band snaps behind him with a definite jazz beat, and his vocals retain that jazz phrasing he developed early on. The entire set has that kind of cocktail hour sense of smart sophistication of that era. If Dean Martin personifies the cocktail lifestyle, Cole is right up there with him.